I love the sound of the Purple Martins on Spring days, especially first thing in the morning. We have 96 Martin gourds and a Martin hotel that will accommodate 24 couples, so we have room for 120 pairs of Purple Martins. Last year we had approximately 650-700 Martins here in late July for about a week or ten days, roosting on the crossbars of the gourd supports. It was an amazing sight to watch them all come to roost in the evenings. About a month ago, my darling hubby added the Martin hotel to the top of the Martin gourd pole farthest away from our front porch. My darling hubby became an unemployed welder in March 2009 and now works 10-12 hours weekly @ Publix. He prefers to do things around our home and take care of his mom and my parents. I love it that he can and does! We have chickens and raise eggs for our own consumption and for hatching each Spring with my students. I am trying to get him to add various chickens to raise and sell. I'd also like to sell produce. My dad has quite the garden each year, and I think hubby and I should pitch in, increase the size of the garden, and make it a family venture. I love doing Candy Bar awards each year for my students. I am working on finding just the right award for each student. It's easy with some students, harder with others...takes lots of thought for me. I feel the need to praise the Lord in all things, especially lately. Of course we need to pray without ceasing, but we must remember, too, that He inhabits the praises of His people...of which I am one! I hope you are one of His, too! Candy Bar rewards sounds awesome. How long have you been doing them? Glad I found your blog. Hi - Love your needing - we all need to do that...thanks for the reminder. God bless you today. 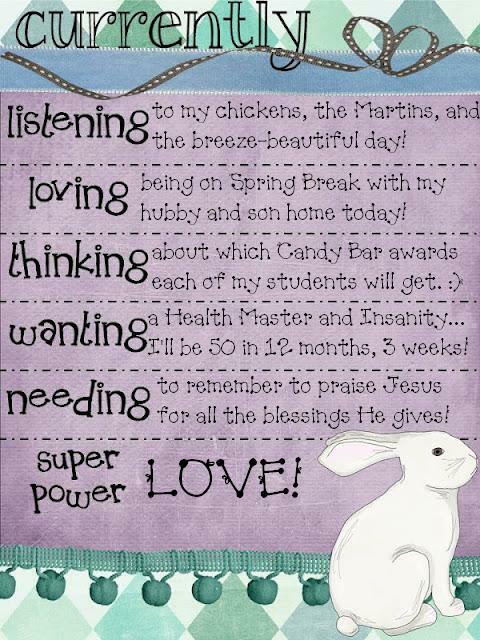 I'm enjoying my spring break with my hubby and kiddos today too...LOVE IT.